A Russian Progress M-12M cargo ship blasts off from the launch pad at the Baikonour cosmodrome on August 24, 2011. 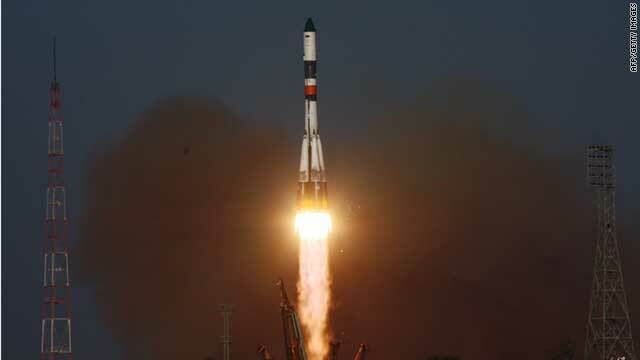 Moscow (CNN) - The Russian space agency on Monday postponed the launch of a new manned mission to the International Space Station due to last week's accident in which an unmanned cargo craft was lost, the state news agency RIA Novosti reported. Alexei Krasnov of the space agency, Roscosmos, said the next manned mission, originally planned to launch on September 22, now would occur in late October or early November, according to the RIA Novosti report. In the United States, NASA's space station program manager told reporters Monday that the timing of the rescheduled mission could force the temporary de-manning of the space station later this year. However, the NASA official, Mike Suffredini, said no decisions can be made until a commission appointed by Russia completes its investigation of the August 24 crash involving a Soyuz rocket - the same kind used to power the flights of crew members to the space station. With a planned rotation of the six crew members aboard the space station scheduled to begin next month, a delay in using the Soyuz could prevent the ability to bring replacements, Suffredini said. "If we don't have Soyuz flying by the middle of November - the 16th or so, the normal landing time for the last crew - we would have to de-man ISS at that point," Suffredini said. The six astronauts at the space station are three from Russia, two from the United States and one from Japan. Those idiot russians and seriously we need a shuttle replacement immediately if they knew this was gonna happen for a year or so why didn't they start planning then? Really, chill out dude. The Russians were savey enough to save millions by not developing a pen that could write in space... they used pencils. Hang on, shouldn't you be saying those idiot Americans since, as you say, they should have had a replacement. Launcher failures are a sad fact of life. U.S. unmanned launchers are designed expecting that 1 in 20 will fail. (Manned is 1 in 100, which is sadly about right for the Space Shuttle.) Higher reliability has been extremely expensive. This means that the current ISS situation was predictable. We need more than one launch system capable of reaching the ISS because of this exact contingency. With the Space Shuttle retired, I hope SpaceX's Falcon 9/Dragon can fill the gap soon. I just hope either Soyuz is reapproved for manned flight or Falcon 9 is approved for manned flight before we lose the ISS. Is it too early to bring the shuttles out of moth balls? This is terrible news.